Superior Muscle X Review - Does It Really Work? Dave Walker Date: December 19, 2014 Pre Workout	1 Comment on Superior Muscle X Review – Does It Really Work? For most guys, building and maintaining lean muscle mass is a lifelong quest that never seems to be completely fulfilled. After you battle your own limitations in strength and size, you are facing the formidable enemy known as aging. Due to dietary, genetic, and resource limitations, most guys never realize their true muscle building potential. Let us not forget that for the average Joe, there just isn’t enough hours in the day to do what is truly needed to get to the Arnold-level of huge and jacked. This is where supplements have come to the figurative rescue. Let’s take a look at the finer details of this supposed muscle building wonder supplement to see if it’s the real deal. First and foremost, I’d like to point out that finding a complete list of the ingredients online is about as easy as finding the Holy Grail. Until that bottle is in your hand, you are clueless as to what is contained within. Yes, they make it a point to mention L-Arginine, but that’s about it. Why all the trouble over a simple nutrition label? I’ll address that point below. In the meantime, let’s take a look at what has been reported to be inside the supplement. You’d be hard pressed to see this ingredient missing from a variety of different types of supplements. L-Arginine is an amino acid that has received a good bit of positive attention over the last several years due to its importance in the muscle building community. Why all the commotion? L-Arginine has been shown to successfully increase the production of nitric oxide in your body. That’s great news if you’re trying to pack on mass as nitric oxide positively influences the release of growth hormones. What’s more, L-Arginine can support protein synthesis, also important for muscle building, and speed up recovery time. Overall, a great start to a muscle-building supplement. 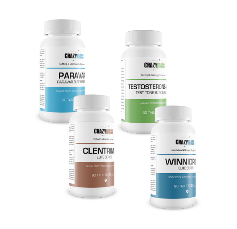 Just like L-Arginine, Chromium is an ingredient that is being tossed into many different types of supplements. From fat loss to muscle building to energy boosting, Chromium is gaining a lot of attention and with good reason. Chromium may help to reduce body fat while triggering lean muscle mass gain. How does it work? Chromium helps to create an anabolic, fat-burning environment by supporting insulin. This ensures your muscles are ready to soak up nutrients and grow. Green Tea Extract has been in the spotlight after being place on center stage by celebrity doctors. GTE is able to increase your resting metabolic rate, resulting in a greater amount of energy expenditure. The hotter your metabolism burns, the more calories that the body incinerates. Now, when it comes to muscle building, Green Tea Extract increases insulin sensitivity, ensuring your muscles are able to soak up nutrients for growth. B Vitamins, specifically B3, B6, and B12, are being tossed into most pre and intra workout supplements. Why the sudden interest in the Bs? These three B-vitamins have been shown to provide a boost in energy and endurance levels. They also support the post-workout recovery process, allowing your muscles to heal and grow more efficiently. Put simply: You can’t go wrong with B-vitamins. 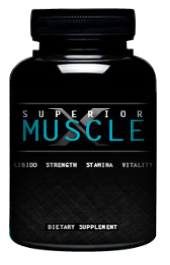 You can only purchase Superior Muscle X from the official website. The company is supposedly providing you the supplement for free, so long as you pay shipping and handling at $4.99. The catch is that if you don’t return the product before the end of your 14 day trial, you will be billed $84.98. On top of that, you are enrolled in an auto-debit program each month! That means you’ll be billed $84.98 every month until you cancel. Modern science has revealed the benefits of specific ingredients to provide an uncommon edge for many underdeveloped fitness enthusiasts. The result has been a booming industry that is host to as many well-wishing companies as there are scams. Superior Muscle X is certainly one of the latter. The company is very misleading in that it does not offer an open disclosure label, as many reputable companies do, and they automatically enroll you in an outrageously priced auto-ship, if you don’t read the fine print. What’s more, the auto-ship rip-off aside, the ingredients of the product (assuming these are the true ingredients) are NOT worth $84.98! For that amount, you could buy each of those ingredients individually and still have money left over. Case in point, stay far away from this supplement scam. Leave Your Review of Superior Muscle X Below! Kraemer, WJ. “The effects of L-carnitine L-tartrate supplementation on hormonal responses to resistance exercise and recovery.” 2003. http://www.ncbi.nlm.nih.gov/pubmed/12930169. Web. Ostojic, SM. “Yohimbine: the effects on body composition and exercise performance in soccer players.” 2006. http://www.ncbi.nlm.nih.gov/pubmed/17214405. Web. Finally a real review… The front page of Google is filled with fake reviews of this product. I went on the website and tried to get the free trial but after reading about the ridiculous monthly fee I closed the page. About a week later I got a call from an odd number where this dude was trying to sell me this stuff at a “discounted” price, he was very unprofessional and even used profanity over the phone before hanging up. This is a total scam.